Fishing in any TEFF competition will be carried out in the spirit of, and with respect for, the traditions of the sport. Competitors are not permitted to engage in any form of betting, including sweepstakes, connected with their competitions. Where required in England, all competitors must be in possession of a valid Environmental Agency rod licence. To Participate in a TEFF national competition, an individual must have been born in England, or be a citizen thereof, or have resided therein for at least 3 years preceding the date of the competition. For this purpose, Monmouthshire is considered to be part of Wales. Anyone living within 5 miles of the border between England and Scotland is considered eligible to fish for either country. Entry is limited to those who will be at least 18 years old on May 1st of the following year. Only one entry per person per year is allowed in each TEFF national competition. Any dispute or complaint must be reported to a match official within 30 minutes of the end of the match. A sub-committee is to be formed of the organiser and a minimum of two officials of the organisation responsible. They shall adjudicate within one hour. If the sub-committee considers that a competitor has not complied with the rules, it may disqualify. It may also refer the matter for further disciplinary action. In that case, a full report must be made to the appropriate authority within 7 days. A competitor may appeal against a decision to the TEFF, (or Organising Body as appropriate) in writing, within 7 days of being informed of any penalty. Any review must be concluded within 28 days. Matches shall be fished with artificial fly only. Flies may be dressed on single or double hooks; tandem flies are not permitted. In the case of a double hook, the angle between the bends shall not exceed 90 degrees and, when viewed from the side, the bends must lie one behind the other. No fly shall be artificially weighted. No more than 4 flies, only one of which may be dressed on a double hook, may be mounted on a cast and flies must be at least 20 inches apart. Hooks may not measure more than five-eighths of an inch overall, including the eye. The overall length of the fly may not exceed fifteen-sixteenths of an inch. Suspected illegal flies should be put into an envelope and signed over the seal by the angler/boat partner/boatman. The envelope should be presented to a Match Official at the end of the competition. Attractor chemicals and light emitters may not be used on flies. Lines, casts and leaders shall not be additionally weighted. No form of shooting line, metal core line or metal core braided leaders is permitted. A competitor may use one rod not exceeding 12 feet in length and may have a spare rod of the same maximum length. But only one rod may be mounted. A rod is considered mounted if any two sections are joined or if a reel or line is attached. A competitor’s rod, when working flies or retrieving casts must be hand held and must be above water level. Boats must be allowed to drift freely during fishing and must not be held on oars, drogues or engine in such a manner as to interfere with, or gain advantage over, any other competitor. Flies must be out of the water whilst the engine is running or the boat is in forward or reverse motion. Trolling lines or flies behind the boat is never permitted. During a match no boat may encroach within 50 yards radius of any other boat engaged in fishing. The water between boats may be shared. The match organiser may extend the 50 yard separation as befits the venue. 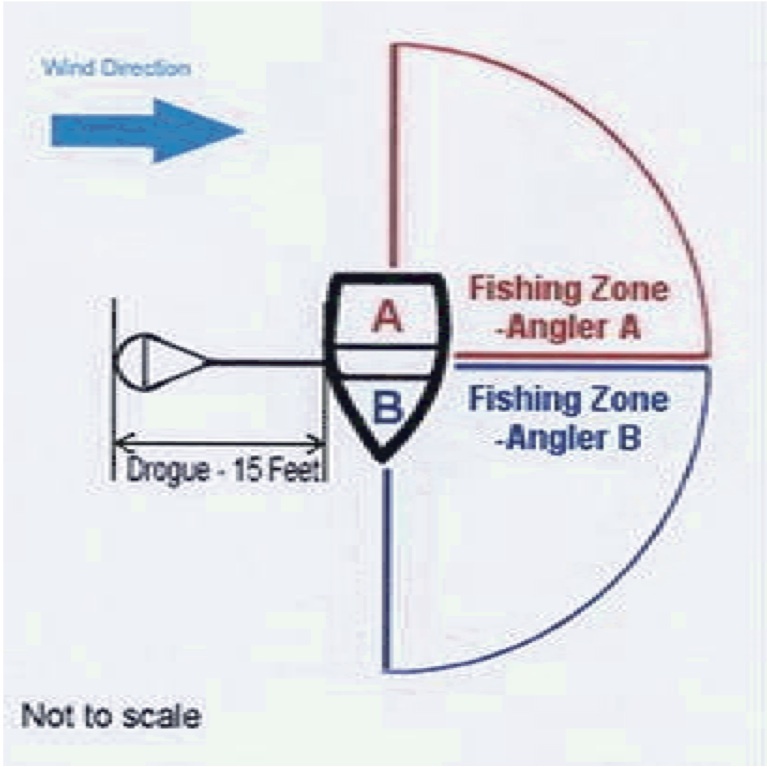 Competitors shall fish within the bounds shown in this diagram and may not fish in their partners’ zones. Whilst a competitor may cast into an ‘Out of Bounds’ area, the boat may not enter these areas whether fishing or not. Boat seats, thwart boards and the use of tackle boxes as seats are allowed, provided the height of the seat is not more than 5 inches above the gunwales. – Note – ‘Backrests’ are also allowed on boat seats – Competitors must not stand in the boat when casting or retrieving line. Standing in the boat whilst fishing is allowed only when playing or landing a fish. Command of the boat will change every two hours. Competitors shall change ends every two hours or as mutually agreed. A single un-weighted drogue is permitted, of no more than 60 x 60 inches or 25 square feet. It may be fitted with functional metal fittings such as small link rings and swivels. The only control device allowed is a ‘G’ clamp. The drogue may be fixed on either side of the boat such that the drift is square to the wind. The drogue must trail no more than 15 feet behind the boat. In congested areas, boats must not deny reasonable access to other boats by undertaking repeated short drifts. Special care must be taken in such circumstances, especially when manoeuvring the boat.-Boats are to keep at least 50 yards from bank anglers. Competitors may not use electronic devices, such as echo-sounders, fish finders or radios during official practice days or match days. MOBILE TELEPHONES are ONLY allowed on PRACTICE DAYS. The match organiser, hereinafter referred to as the ‘organiser’, will advise competitors of any local rules which augment or otherwise affect the competition rules. The organiser shall fix the hours of fishing. In the event of dangerous weather, the organiser may change them, or the date, as necessary. Competitors shall not fish before the start time and must begin from the start zone. They must return to the finishing zone, in the boat in which they set out, no later than the match finish time. Trout are the only permitted species. The organiser will specify any limitations, e.g. restrictions on brown trout, or the minimum size that may be weighed in. To prevent competition results being distorted by an individual fish, the organiser may fix a maximum weight, usually 4 lbs. In this event, the trout would weigh 4 lbs for the bag-weight but be credited with its full weight for any heaviest fish award. If both boat partners reach their individual bag limits early, they may leave the water and hand in their bags to an official. The fish should be collected from the official and presented at the weigh-in. All competitors must report directly to the weigh-in immediately after the match finish time. Nil returns are required. Anyone not reporting within 30 minutes of the end of the match will be deemed to have a nil return. Competition results will be decided by the bag-weight of the fish, the higher weight taking precedence. If weights are equal, the greater number of trout will prevail. If there is still a tie, the heaviest individual fish will take precedence. The organiser and the water authority will agree a bag limit per individual. When a competitor reaches that limit, the time is to be recorded by agreement with the boatman and/or boat partner. A time-bonus weight, set by the organiser, will be added to the angler’s catch for every full quarter of an hour remaining in the competition. Boatmen and boat pairings will be allocated by public ballot at a time and place announced by the organiser – or by a computerised draw system which may be used if agreed by the AGM of the TEFF, Federation or club concerned. If assistance is required, an oar should be raised to alert officials. During competition hours, a boat may be beached only in an emergency such as medical, boat, or severe weather problems. In these circumstances, the competitors may if necessary return by other means but must report immediately to an official who will treat the incident as though it were a complaint made under TEFF Competition Rule 4 – See TEFF General Competition Rules. Competitors are strongly advised to wear buoyancy aids and eye protectors when either travelling in, or fishing from boats. Matches shall be fished with artificial flies on barbless or de-barbed single hooks. Not more than three flies shall be mounted on a cast. Flies may be artificially weighted. Fly irons will measure not more that five-eighths of an inch overall, including the eye. The overall length of the fly shall not exceed fifteen-sixteenths of an inch. Flies may be of any pattern and material and may be fished floating or sunk. Attractor chemicals and the use of light emitters are debarred. A competitor may use only one rod at a time (maximum length 12 feet) but may have a second ready mounted as a spare. Any manufactured line may be used. Braided leaders, weighted or un-weighted, are allowed. Coloured sleeving may be used at the end of the fly line to improve visibility but no other bite indicators are permitted. A ‘sacrificial’ floating fly is not deemed to be a bite indicator provided it is one of the three permitted flies. Competitors must provide for themselves landing nets made of knotless mesh. Competitors may fish anywhere within their beats provided that they do not approach within 30 metres of another competitor who is fishing. They may fish the same spot for up to 30 minutes. After that, if requested by another competitor, they must move at least 30 metres and may not return to the spot for at least 30 minutes. At the end of each session every competitor must move at least 30 metres from the spot he/she is fishing, irrespective of how long he/she has fished there. Any angler whilst measuring a fish shall be deemed still to be fishing in the same place where he hooked the fish. No competitor may walk or cast outside the beat. Should a fish move outside the beat, it must be played from and landed within the beat. If a fish is hooked at the end of a session, five minutes of the next session is allowed in which to net it. The match organiser, hereinafter referred to as the ‘organiser’ will advise competitors of any local rules which augment or otherwise affect the following rules. The organiser will fix the hours of fishing. Trout and grayling are the only permitted species. The minimum size limit that may be set in England is 15cm from nose to the tips of the tail. The organiser will specify and further limitations for a particular event. The organiser will divide the competition venue into four beats, with 8 competitions per beat. The draw for the beats will be carried out by a minimum of two TEFF officials. Each competitor will have a controller who will stay with the same competitor throughout the competition. Controllers will be responsible for ensuring that those on their beats comply with the rules. To be fair to all, they are not to give advice, net fish or in any other way give advantage to their competitors. Catch and release will apply. All fish must be netted and presented to the controllers whilst still in the landing net. At the time of netting, the hook must be in the fish’s mouth; if the fly drops out in the net, the fish will still count. The controller and competitor will agree the overall length of the fish and the controller will record it on the score card. The competitor will carefully return the fish to the river, making sure that it can swim away before releasing it. Each qualifying fish will score 20 points plus 1 point for each centimetre or part thereof. For example, a fish of 30.3 centimetres will score 20 plus 31, ie 51 fish points. The scores for the four sessions will be recorded separately. At the end of each session, both the controller and the competitor will initial the scorecard. Competitors from each of the four beats will be ‘placed’ separately, according to the points they have scored in each of the four sessions, i.e. in each session, the top competitor on each beat will earn a ‘1 placing’, the second a ‘2 placing’ and so on. A blank will earn an ‘8 placing’. Individuals’ placings in the four sessions will be summed and their totals will decide their positions in the competition. The top individual will have the lowest total of ‘placings’ and so on. A tie will be decided on highest fish points. If anyone sees anything which appears to contravene the competition rules, he/she is asking to notify the individual concerned if possible, and to report to the organiser under the procedure set out in the TEFF General Fishing Rules.